If you’re a newbie to Google AdWords, you have probably worked out at least one thing – it’s not the easiest platform to pick up! You can’t just log in, set it up and leave it to run itself. There are complicated settings and countless options for keywords, ad types, ad extensions, bid adjustments and so much more. It’s so complex that I wouldn’t blame you if you took one swift look at AdWords and subsequently abandoned all hope and never logged in again. 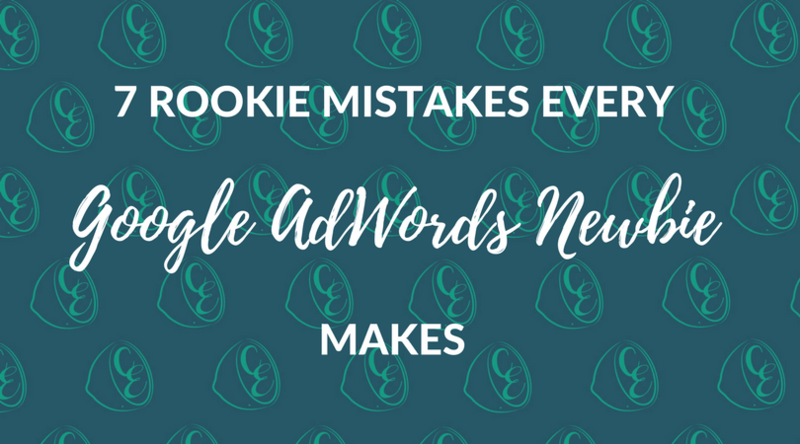 However, with a little preparation and background knowledge, you can avoid these 7 rookie mistakes that every Google AdWords newbie makes. If you’re new to AdWords, you may have had advice to use AdWords Express instead of the ‘normal’ Google AdWords. This may seem like the simpler option but AdWords Express is much harder to control. The settings in AdWords Express are extremely limiting and your ads can end up showing for all sorts of irrelevant search terms. This, in turn, means your ads are showing to people who are just not interested in your products or services. As a result, your return on investment (ROI) is unlikely to be that great. Avoid this rookie AdWords mistake and start with a normal Google AdWords account, not AdWords Express, from day one. Google has a selection of default settings in place when you set up your campaigns, ad groups, ads and keywords. They claim it will make your set up easier, but really they’re just going to end up costing you money. This includes things like showing your ads on the display network (not just when people search on Google), showing your ads on Google search partner websites (not just Google), and keywords being added as broad match if done within the AdWords interface. None of these settings is a good idea if you want to reach the right audience and keep your cost per click as low as possible. Now, this might seem like a great idea – Google offers free set up and management of your AdWords account for 3 months. But remember, at the end of the day, Google is a business – they want you to spend your money with them. So often when they set up accounts, they are also using settings and targeting that means they are going to make money. Someone once described this as ‘taking gambling advice from the casino’, and that’s so accurate! I’ve seen campaigns set up by Google with all broad match or broad match modified keywords, settings that allow search ads to appear on the display network, location targeting not tight enough to the business location and so much more. Google often uses settings which mean your ads will reach the most people, not necessarily the right people. If you want to achieve a good click-through rate, your ad needs to stand out from the crowd. If you don’t have any ad extensions set up, your ad won’t take up as much real estate space on the search results page. This makes it much easier to ignore than an ad showing sitelinks, a location, call outs and a phone number. Ad extensions that are available on Google AdWords include your physical business address (location extensions), your phone number(call extensions), links to key pages on your website (sitelinks), unique selling points (callout extensions), as well as price extensions showing costs for your products and services and message extensions where customers can send you a text directly from the ad. The more of these extensions you can use (and use well) the better. So many Google AdWords newbies will make this crucial mistake – setting up one campaign, with just one lonely ad group. In that solitary ad group, they’ll put a whole variety of keywords, and that’s one of the worst rookie Google AdWords mistakes you can make. Campaigns need to have a range of highly specific ad groups that contain only very similar keywords. That way you can write your ads to target those keywords or variations of them, which will improve your quality score and decrease your cost per click. Having multiple ad groups (as described above) allows you to have multiple, highly targeted ads for each ad group. An example would be a kitchen accessories store that sells mixers, baking trays, coffee plungers and other kitchen accessories. There’s no point showing an ad for baking trays if someone has actually searched for coffee plungers. If you have all keywords related to baking trays, muffin tins, rolling pins, mixers and other accessories all in one ad group, and only one ad which talks about coffee plungers, what are the chances someone is going to see your ad as relevant to their search? Another rookie mistake I see ALL THE TIME is no negative keywords being added to the campaign on a regular basis. Did you know you can scroll through all the search terms that people have actually Googled and then clicked on your ads? I swear if people knew that other people could see what they were searching for, they would be a lot more careful about what they Googled! Going through these search terms on a regular basis will help you see if your clicks have all come from relevant searches. If not, add these terms as negative keywords so that if someone searches for these again, your ad won’t appear and they won’t waste your budget with their irrelevant clicks. I like to do this at least once every 2-3 weeks with my clients, more often if possible to ensure minimal wastage. Avoid these 7 rookie Google AdWords mistakes – take your time learning more about Google AdWords before handing over your credit card details to Google. If you don’t have the time or the inclination, hire a Google AdWords management consultant like me!